This vivid depiction of life in the late Permian Period that happened about 260-280 million years ago, by celebrated paleo-artist Josef Moravec, is a print from his original oil painting. The subject of this dinosaur painting is the Dimetrodon grandis, who surprisingly, was a member of the therapsids, or “mammal-like reptiles”, a branch of which spawned the very first mammals in the soon-to-come Triassic Period, which was the beginning of the Mesozoic Era. The Permian was the last period of the Paleozoic era, and was very much a time of change. Arguably, the greatest period of extinction the earth has seen occurred at the end of this time, with over 90% of the existing marine species perishing, along with up to 70% of land creatures. This event is known as the Permian-Triassic Extinction, and there are many theories in regards to its cause; scientists speculate it could have been caused by massive volcanic activity, the collision of a meteorite in what is now Antarctica or intense radiation from a nearby supernova, but no one knows for sure what caused this mass extinction. It would take the earth over 30 million years to recover from this catastrophic event. The star of this realistic painting, Dimetrodon, was an apex predator of his day, and grew to be almost 10 feet long. A distinctive feature of Dimetrodon, which means “two measures of teeth” was the fact that these creatures had teeth of two different types, shearing and sharp canines, unlike reptiles. 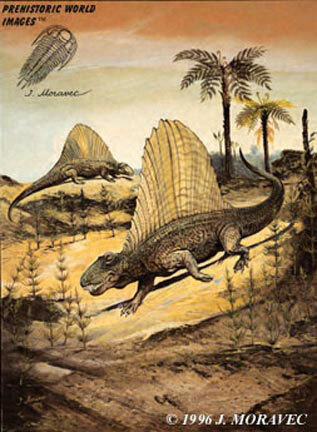 Another distinctive feature of Dimetrodon was the huge sail that towered over his back, supported by spines that connected to each vertebra. Whether the sail’s purpose was to help the animal regulate its temperature, or was part of its mating ritual is unknown. At the same time, a group of small reptiles started to become more prolific. They were called diapsids, and are the ancestors of most of the reptiles we see on Earth now, and also of the soon to be rulers of the planet, the dinosaurs, as well as pterosaurs, crocodiles and modern birds. This time of great change would lead to “The Age of the Dinosaurs”. With the drier climate, terrestrial plant life was evolving, too, away from ferns and mosses to the first conifers, called gymnosperms, which reproduced by enclosed seeds. Josef Moravec, the artist of this realistic and accurate Permian Period painting, has been recognized for his excellence by Museums of Natural History throughout the United States and Europe. His love for dinosaurs started at the age of three, when he began making his own dinosaur pictures, creating his first dinosaur oil painting at the age of nine. Though trained as a graphic artist, his love of paleontology and his unique vision of this “lost world” led to his career as a world-renowned paleo-artist.